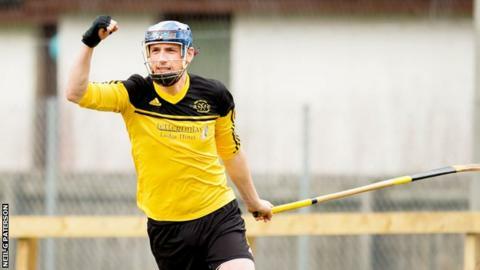 Most senior shinty teams were on MacAulay Cup duty at the weekend, with Newtonmore, Kingussie, Lovat, Oban Camanachd, Glasgow Mid Argyll, Glenorchy and Kyles all progressing through to the second round. National division Fort William met Premiership Glenurquhart for their cup tie at An Aird under glorious sunshine. As I had mentioned last week, this game was to be a good benchmark for Fort, playing against a top-flight club after a transitional season saw the former relegated at the end of last year. Both teams had chances in the first half, however solid goalkeeping from Stuart MacIntosh between the Glen sticks led the game into half-time goalless. Fort William looked the sharper of the two, resulting in a second-half Arran MacPhee goal, off the back of a fantastic MacIntosh save from Gordie MacKinnon, and a single goal proved to be enough. A great win for the club, however not without issue. Scotland and Fort full centre Niall MacPhee was red-carded in the 90th-minute for allegedly kneeing a Glen player on the ground that had been involved in a previous incident. It appeared to me that this did not happen and the referee on this occasion got it wrong! Unfortunately in shinty because of a lack of evidence and so on, there is no way at present to appeal against a red or yellow card. This leads me on to my question this week. Do you think there should be measures in place to allow the appeal against a red or yellow card within the sport? There are not many games televised across the many fixtures and leagues within the sport, however between, BBC Scotland, BBC ALBA, and online coverage from other broadcasters, do you think that the Camanachd Association could look at each case as presented? This could be further backed up by clubs filming their own games to protect players from mistaken identity or refereeing errors, which we have all witnessed on the field over the years. Referees of course are only human and, like the rest of us, occasionally make mistakes. However, if conclusive evidence was to be presented to the Camanachd Association, do you think there should be a policy in place to review each case on that basis? Maybe there is a better way to do it and if so let's hear your thoughts and views on this. I also sustained a broken middle finger on Saturday. However, after an appointment at the fracture clinic on Monday thankfully I won't miss any concerts and fingers-crossed - pardon the pun - not too much shinty. A huge thank you to local businessman Russell Fraser, who had already provided my right hand with an ashguard glove and who has now done the same for the left! Why on earth I hadn't thought of this at the start, I'll never know.